The last few months have not been easy. I’ve had unexpected news from the doctor; scary appraisals from the plumber and house painter; and my spirit-reviving winter vacation will be delayed. Oh, and a new operating system at work is making my hair stand on end for eight hours a day. If I ever needed a comfort scent, it’s now. Many of my perfume-loving friends turn to “food-y” perfumes in times of woe, but I usually don’t enjoy gourmand fragrances. I’d rather eat cake and caramels, and drink hot chocolate for comfort than smell them on my skin. I opt for perfume simplicity in turbulent times — fragrances that play with, and display, just a few notes. A comfort scent shouldn’t be too powerful either; it must not “intrude” on calamity but buffer it. For my current tempestuous cycle, I’ve opted for an oldie perfume: Caron Pour un Homme, a fragrance that debuted in the 1930s when lots of people around the world needed comforting. Pour un Homme was developed by perfumer Ernest Daltroff and its original list of notes included bergamot, lemon, rosemary, lavender, sage, rose, rosewood, cedar, tonka bean, vanilla, oak moss, and musk. Though it must have been reformulated many times over the last 77 years (Caron only lists vanilla and lavender in today’s version) Pour un Homme still smells good. Pour un Homme opens with crisp lavender leaf and cold, almost “medicinal” vanilla; Pour un Homme’s vanilla notes are bracing, like a soda fountain concoction, but more elixir than “treat” (nothing cloying here). The combo of lavender and vanilla produces, in mid-development, an aroma that smells a lot like immortelle with its malt-y/burnt-sugar scent. Pour un Homme’s strawflower aroma makes me think of clearing the garden in autumn and bringing dried, but bright, flowers inside. Pour un Homme’s base smells of pleasant, light, slightly powdery amber-musk and retains a hint of lavender in the background. For me, there’s not one jarring moment in Pour un Homme; its old-fashioned aspect (cottage-garden lavender meets baby’s bath time) makes me feel safe, secure, coddled…and nostalgic. I bought a big bottle of Pour un Homme, and I hope my troubles disappear long before it does! Caron Pour un Homme is available in Eau de Toilette, in a variety of sizes up to 750 ml. In the US, it can be easily found for less than $45 at the online discounters. Where on earth did you find that picture of a rugby playing lycanthropic centaur? It’s hilarious in juxtaposition with Kevin’s description — I’m trying to imagine that dude in a lavender-filled cottage garden, and/or bathing an infant. well, the sense of beauty was definitely different those 80 years ago. So many times advertisements are about the opposite of reality. Candy scented fragrances are described as sophisticated. The umpteenth blackberry scented floral is described as radical and innovative. Refomulations are followed by ads describing a scent as classic. Starlets who do more than approve a bottle designed by others are described as having been intimately involved in the development of a perfume. Heck, 90% of the time, the word “starlet” is an overstatement about a “personality” who is not even a budding actor or singer, but someone who gets their name on the gossip pages primarily for being photographed for other gossip pages. Whoops! I guess Luminous Phen. just beat me to it – sorry to be redundant. Emily: he looks pampered…look at those shiny locks. LOL! Now imagine being an infant at bathtime, as per Kevin’s description. HA! 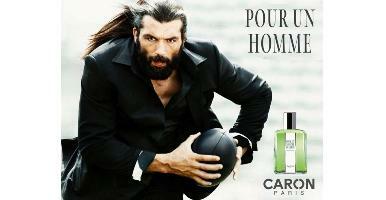 I think it was the very latest Caron ad for Pour un Homme! I remember all the hoopla about this ad a few years ago. Since then, it’s been one of my fave ads – memorable and hilarious. He looks more sophisticated in the side profile one, but I love the eyes and threatening momentum in this one. I hope things look up for you soon, Kevin. This sounds like a perfect winter bedtime perfume. As long as the lavender isn’t *too* huge and beats you over the head since I can’t take it in really huge proportions. But it can be really soothing when blended with other notes, particularly vanilla. Abscent: thanks, and yes, it’s a good bedtime scent. It is a comforting and pleasure-inducing scent, and, as you are implying, it doesn’t ask for any intellectualizing. Very best wishes for your health, and your house. Hope you are ok.
Nice review! Hope you do get some comfort from Pour Un Homme. I must say, I enjoy wearing it from time to time, too! For some strange reason, the Carons have mostly flown under my radar. I love lavender though, and might have to seek this one out for a test drive. Funny that this should come up as, by about mid-morning, I found myself wishing I had worn Jicky. Here’s hoping that your road smooths out. It makes me appreciate your reviews all the more that you take time out from all that’s going on in your life. Thank you. Rappleyea: Caron does lavender perfumes well. Writing a review is a pleasant way to avoid other things! lol – as is reading reviews! Pour un Homme de Caron is the my latest fragrance I bought, in july, to be certain. For me it was a blind buy as you can’t buy it in mainstream perfume shops and I couldn’t get a sample. But I trusted people who recomended me Caron PUH on my monday mail here. I too, turn to simplicity for comfort. Lovely review, but I don’t like the inspiration. Best wishes for less surprises at the doctor and reliable contractors. Do report in on both. Alyssa: it’s all a crapshoot, but perhaps “My Hospital Perfume Choice” and “What to Wear on Demolition Day” are future posts…. Kevin, when my father became very ill last fall, I had to pack fairly quickly for travel. Without thinking much, I grabbed our bottle of Pour un Homme and made a large decant to and threw it in the suitcase. My husband and I both wore it for several days, and it turned out to be the perfect choice for what turned out to be a stressful week. It really did comfort me, and it’s now my “go to” fragrance for such occasions. Best wishes to you as you wrassle those challenges to the ground! Hope things improve. I’ve had contractors that have left me needing to be medicated. This sounds really nice. I love lavender and vanilla so I’m putting it on my list. Oh, I am so sorry that you are stressed. If there is work necessary at your house, please get several evaluations, don’t necessarily chose the lowest, and check with your state that the plumber is actually licensed. Yes, there is something very comforting about vanilla, perhaps because it has a milky scent which stimulates some childhood scent memories. Its always great to find one which does verge into custard territory. (Like you, I’d rather eat my comfort foods). In fact, your description of Homme is so beautiful that it comforts me just reading it. Why do all IT people assume that out jobs consist of adapting to new softwear and operating systems? For most of us, the systems are supposed to HELP US do our actual jobs. Dilana…thanks…the less said about the tech developers the better. Yes, I know what you mean about milky, custardy scents and comfort. I recently sampled Safran Troublant and was amazed how its custardy quality cradled my spirit. I never knew that a food-like scent could do that, and I learned something new about myself. Hey, not all of us are like that! I try to be helpful to our customers…it can be hard when the rest of the people you work with aren’t, though. My favourite Caron is the Big Y. Hail to the king, baby. Kevin, sincerest wishes for good health and I hope the home issues can be resolved without breaking the bank. Helo Kevin. Sorry about the personal and health turbulences you are going trrough. I can only hope you will get better and the computer system will become more friendly with time. Caron Pour Un Homme is one of my favorite fragrances, and the only masculine I wear ( I am a female). I really appreciate its relaxing and soothing properties and it is my “comforting ” perfume. Hope it will work for you as it does for me. One more thing. I always wear it in the summer and fall when we go to Methow Valley for a weekend. In conjunction with the peaceful atmosphere of this area it works miracles..
Behemot: wow…I’ve never been to the Methow Valley…just looked it up and it looks lovely. A perfect autumn day/weekend trip. Thanks. Wow, I wore this the day before yesterday and it really is the perfect comfort scent. My partner hates it and he was out of town, so I decided to enjoy it free of hassle. Luckily I work from home so I can usually wear whatever I want. I just bought this blind from FragranceNet, to round out my classics collection. I noted it came in a 25oz bottle. That’s more than 750 ml- like a wine bottle’s worth. Must be v-e-r-y comforting. Looking forward to sampling it tonight. Ikat: yep…it comes in HUGE amounts like many other classic French “eaux”…must be for the person who pours it with abandon into a bathtub for a relaxing soak…? Another for the list! I hope the doctor has only pleasant surprises forthcoming and that your contractors are that rare combination of reliable and reasonably priced. Hope the Caron blunts the edges for you until things smooth out. Fragrant: as long as the good dr. gives me what I need: opiates!…I’ll get through! You wouldn’t happen to be “the waterboarder” over at Freethought Blogs, would you? If so DON’T DO THAT AGAIN!!!!! Kevin, I hope things turn around for you soon; I’ve been in the “bad news boat” myself for a while so I can not only sympathize but also empathize with you. Unfortunately, I’m not a lavender fan – “comforting” sounds wonderful – but I glad it works for you. The lavender skeers me much more than Sebastien Chabal! Thank you for another terrific review. Even under duress, you come through. Sending positive vibes and wishes your way, Kevin! Faylene/La M: thank you both. And I’m betting Monsieur Chabal is a softie! HA! Here’s another photo of him; I think it proves he has a good sense of humor about himself: http://www.parismatch.com/People-Match/Spectacles/Photos/Diaporama-Happy-Birthday-Mickey/Sebastien-Chabal-84008/. Absolutely! That is why the Caron ad is such a great one. Perfume ads – and perfume people – can take themselves waaaay too seriously. I’m not demeaning perfumery as an art; appreciators and artists in poetry, music, visual art, etc. all suffer from similar poseurism. Caron PH is a scent for gentlemen (and real ladies) and a sense of humour is an important requirement in a gentleman, to my mind. I’d take Chabal (or Frank O’Hara or Beck or Stuart Pearson Wright…) over some androgynous, overwaxed frowning dude any day. The add is really ridiculous, and it does not convey any of the delicate and elegant feel I get from Pour Un Homme. I use to wear it and spray on my bed linen as well, since it’s fairly cheap both online and off the counter… Dear Kevin, hope things will soon line up for you, and I can totally see how Pour Un Homme can bring some comfort. Too bad Caron didn’t come up with anything really interesting recently. Yuzu Homme is a nice scent, but nowhere close to the glorious older brothers… Le Troisieme Homme is still one of my favourite. And how about Tabac Blanc?! Lupo: I wanted to review Yuzu Man but the Caron people in NYC could not find me a sample! Hahahaha some of the first few comments are so hilarious! I’m imagining a face-off between Sebastien Chabal/Pour Une Homme and the Old Spice guy! That rugby player should be in an ad for Yatagan, not Pour in Homme! Aaaaaaa-greed. I can smell the peppery, sweaty, compost (that somehow happens to smell amazing) through the screen of my laptop. I’ve been wearing Pour un Homme since early August. Comforting is a perfect word for it. If I spray it on at 8am and happen to catch a whiff of myself later that day, I can’t help but smile and feel relaxed. Wonderful scent.